Feature For a while it looked like the future of television was fairly clear-cut. Full HD would beget 4K Ultra HD and at some point in the future, presumably when we all owned flying cars and had relatives commuting to Mars, that would evolve into 8K Super Hi-Vision. Apart from trifling things like resolution, colour gamut and frame rates, nothing much else would change. And then something strange happened. Screens began to curve. When the first curved panels appeared they seemed little more than curiosities, a symptom of engineering brinkmanship between arch rivals LG and Samsung. Significantly, they involved OLED, the notoriously difficult to manufacture but super-thin display technology. As Thomas Lee, LG’s VP of Home Entertainment, confided to me last year: “There's a lot of research and development going into curved screens. They’re more comfortable to watch and give you a really immersive viewing experience.” Curves, it seemed, were being fast-tracked to distinguish OLED panels from existing TV tech. Then both South Korean manufacturers solved the conundrum of bending an LED backlit LCD screen, and the curve went from idiosyncrasy to ideology. Fast-forward to Samsung’s recent European product forum, where the brand unveiled its entire portfolio to Euro dealers. 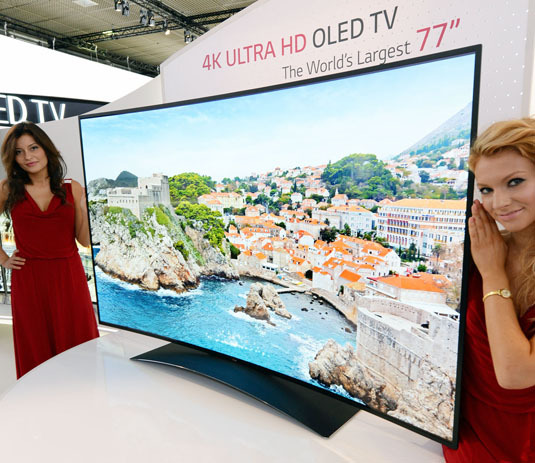 Heading its TV range were curved 4K screens in 55-, 65- and 78-inch screen sizes. President and CEO BK Yoon was unequivocal: “2014 will be the year of curved Ultra High Definition TV,” he pronounced. While the brand will also offer the conventional HU7500 line, all flat 4K screens are locked to 2013 picture processing technology. It’s clear where the R&D is going. Sales predictions are probably way too bullish though. 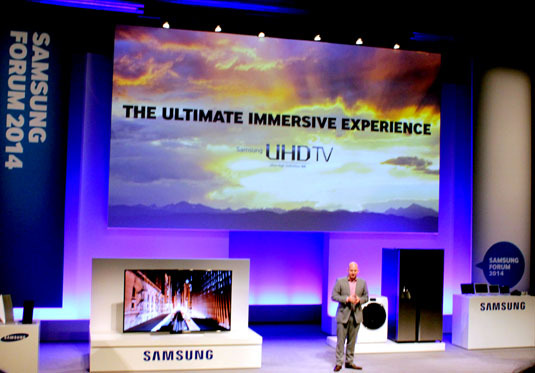 Samsung’s incoming European chief executive Sunny Lee said the UHD TV market was set to “explode,” growing 1,300 per cent in 2014. By 2017, he predicted annual European shipments of UHD TVs to hit 3.3 million units. This might be somewhat ambitious in the light of recent sales figures. He’s not wrong on either count. 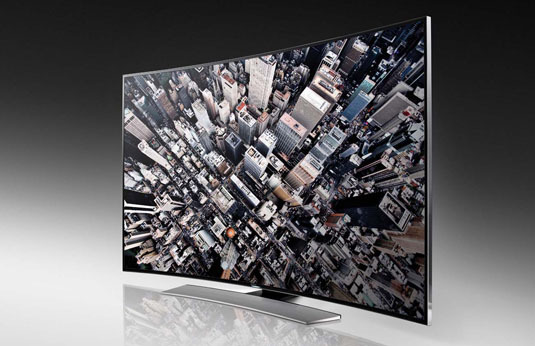 Curves always attract (insert joke here) and the new Samsung 4K fleet is undeniably beautiful of form. But are there actually any technical reasons why a curved TV should provide fundamentally superior viewing experience than a flat one? Much is made of their cinematic aesthetic. There are good practical reasons why movie screens curl. Curved screen fabric offers better brightness uniformity and reduces pincushion distortion caused by the throw distance of the projector; light strikes the entire surface at the same time. This isn’t applicable to TVs, although there is a vaguely comparable benefit. 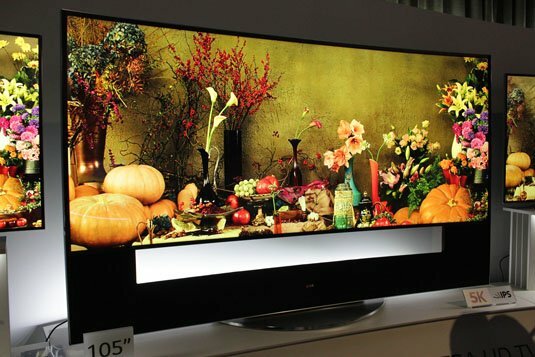 LED LCD TVs tend to lose colour and contrast when viewed off angle. When the edges of the curved set actually angle in to the viewer, this doesn’t happen – colours remain vibrant and contrast stays high. Conversely, move out of the viewing sweet spot when watching a curved screen and somewhat different visual anomalies become apparent. The portion on the closest edge appears to subtly distort. Sit well off to the edge (y’know, where you park grandma), and the physical edge of the screen begins to make itself noticeable in a way that doesn’t happen with a flatscreen. What’s certain is that when you sit in the sweet spot (and there is a clear sweet spot with curved TVs), you’re definitely aware of a wraparound visual effect. This creates an immersive intensity that you don’t get with a flatscreen. A native 4K demo sequence of a POV valley fly-though actually left me a tad dizzy. Not ideal when watching Top Gear, but I suspect playing PS4 on one of these screens is going to be a blast.